Have you been a candidate of theft ? No one can be 100% careful , back in school i have heard alot of stories where people just left their laptops in their rooms , and coming back 'Zooom , laptop is gone . Nothing can be frustrating as that , when you have a lot of documents and information in there. There are lots of steps that can help you protect your laptop and data from theft , not only that , it will also help you recover your notebook and data if your laptop is stolen . 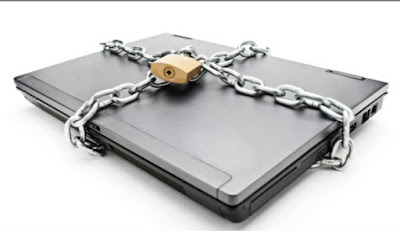 In order to protect your important and sensitive information on your laptop , always remember to keep a back-up file and to encrypt very important files.With this means , even if your laptop is stolen , you will still have your information and the thieves won't be able to access your files . Tracking and recovery software helps track laptop computers if they are stolen and it recovers any stored information .it could secure your tablet in any number of ways. It could actuate a GPS locator once you report your portable PC stolen. It could pinpoint the IP address where your portable PC was last used to discover its area. Some product programs laptop with worked in webcams to take previews of the criminal and email the data to the police. Laptops are so convenient, they're easy to lose. A great many people who discover lost things are sufficiently straightforward to restore these things. Having ID Tags with the contact data on the laptop computers really urges individuals to return them. Instead of placing your own information; which also places you at risk, you could hire a recovery service instead. Recovery services place ID Tags with their address on the laptop, instead of your address. In order to protect your identity, laptop are returned to them and they will in turn return your laptop to you. And further to encourage people to return lost, missing or stolen laptops,The service will also offer cash rewards. For a little fee. Finally , common sense is very common , always be vigilant and avoid showing off to get notice by thieves. Please do share this post to get to other , Thank you ! !